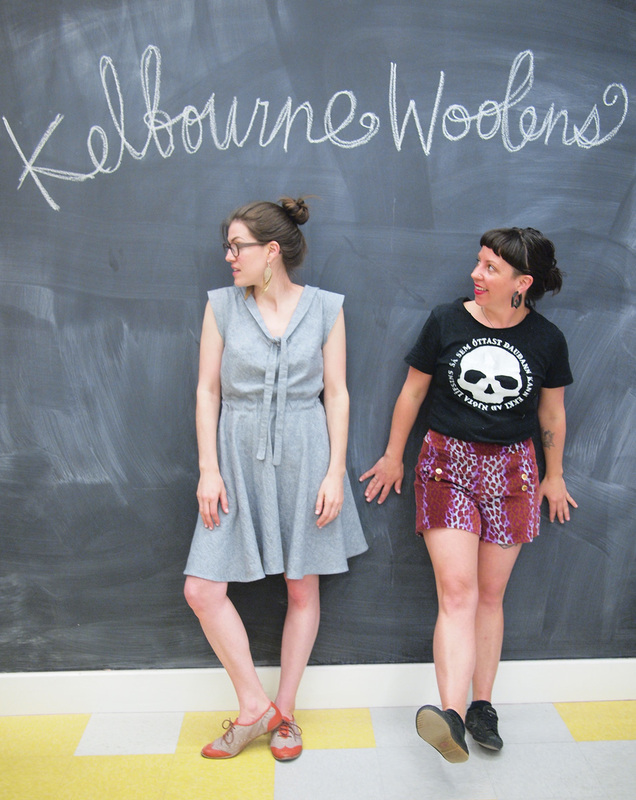 We recently hosted Kate and Courtney of Kelbourne Woolens at Fancy Tiger for a lace shawl workshop and meet & greet. 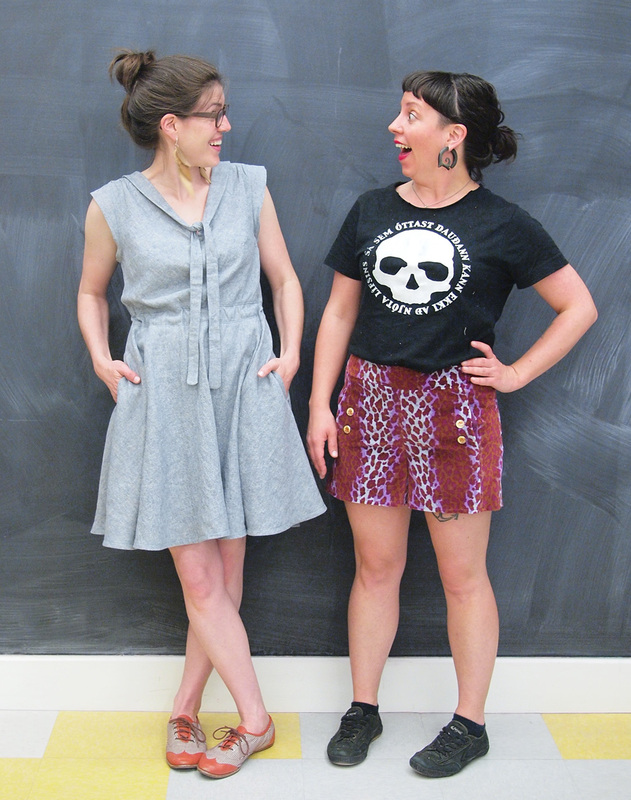 If you were able to attend and meet these ladies in person, you know that they are both a big ol' pile of funtimes. While they were here these ladies--who make a living from all things yarn and knitting related--took full advantage of our sewing classrooms and whipped up some new adorable garments. Courtney Kelley and Kate Gagnon Osborn. Sometimes, we pretend to be one person named Kelly, but that is only when we’re trying to get out of doing something. “Oh, no, that’s Kelly’s job. And she’s not here today….” Courtney really wants her name to be Agnes, and pretends it’s her middle name as a consolation prize, but it’s not. Her middle name is Ashton, like Ashton Kutcher. And it fills her with RAGE. Kate’s mother named her Erin when she was born and then changed it to Catherine when she was six months old. Her reason? When Gagnon was mispronounced as “Gannin” it rhymed with “Erin” and she didn't like the way it sounded. Our main job is as the owners of Kelbourne Woolens, distributors of The Fibre Company yarns. We design knitting patterns, write books, and teach. 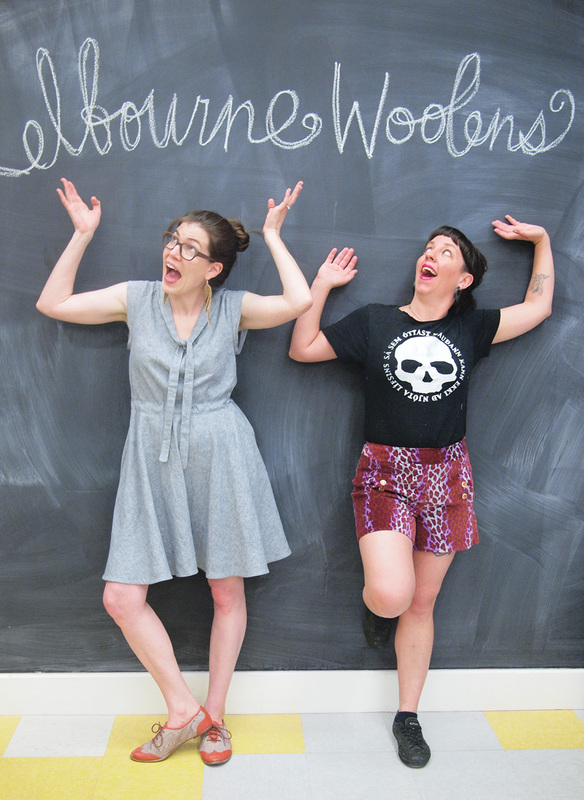 We both have weaving backgrounds and worked in yarn shops, which is also how we met. I (Courtney) was managing an LYS and hired Kate to work part time while she was in grad school at Philadelphia University studying textile design. We started working together designing knitting patterns for the shop and found we worked together very well. We both really like to knit, obviously, but we also are slightly obsessed with needlepoint at the moment. Kate is much more prolific, Courtney has a tendency to purchase projects and then not finish them. 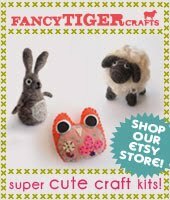 We do ALL the crafts, but not scrapbooking. Definitely NOT scrapbooking. We like things with needles: knitting, crocheting (I guess that is a hook), sewing, needlepoint, counted cross stitch, embroidery. 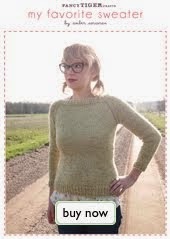 But we mostly knit and sew. And in our dream world, we’d have a warp ready to weave at all times. But you don’t need needles for that. So that and crochet are the exception. Courtney likes to garden, pickle and can things and is a good cook. She mostly refuses to post pictures of her dinner on Instagram, but there have been a couple exceptions. Kate doesn’t cook, instead she does the dishes, and also doesn’t post pictures of that on Instagram. Tell us about what you made while you were in Denver. Kate made the Reglisse Dress by French pattern designer, Deer & Doe. She used a really beautiful blue + white washer linen from Robert Kaufmann. Despite the kajillion yards of bias tape required, she really likes the finished dress! (Full disclosure, due to her crazy short waistedness, she did shorten the bodice after she got home, as she found the armholes to be too deep and the waist to hit her at an odd place. 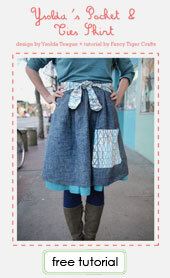 But that is the beauty of sewing, right? Customize, customize, customize.) Since coming home, she has almost completed a second version of the dress out of a striped cotton. And bias tape as hem = her new most favorite technique! 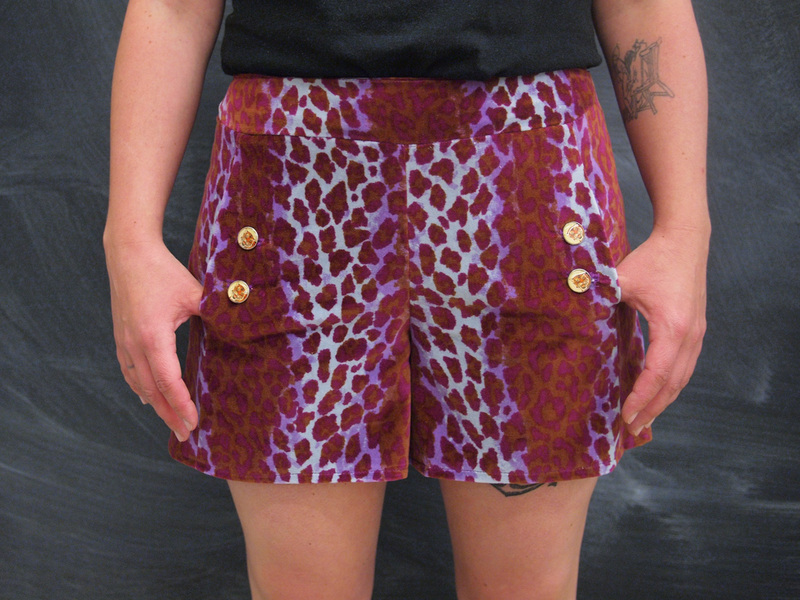 Courtney made a pair of velveteen cheetah shorts with a lovely pattern from Sarai of Colette Patterns called Iris. The pattern was pretty straightforward, but a bit tricky, as Courtney’s hips are like a size 4, and her waist an 8…but we worked it out. She has no waist…such a shame. 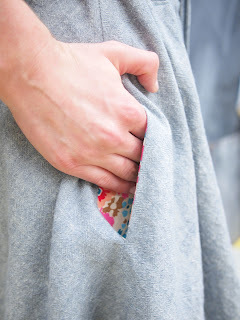 The pattern was super easy to follow, even with the pockets and invisible zipper (which she initially forgot about and had to rip the side out and add it in at the last minute…). 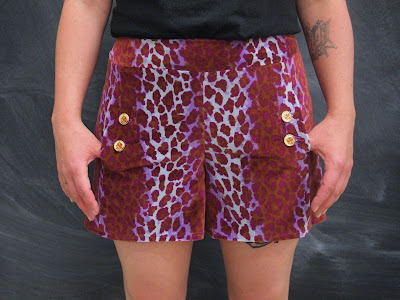 And she used tiger buttons for the pockets in honor of Fancy Tiger! 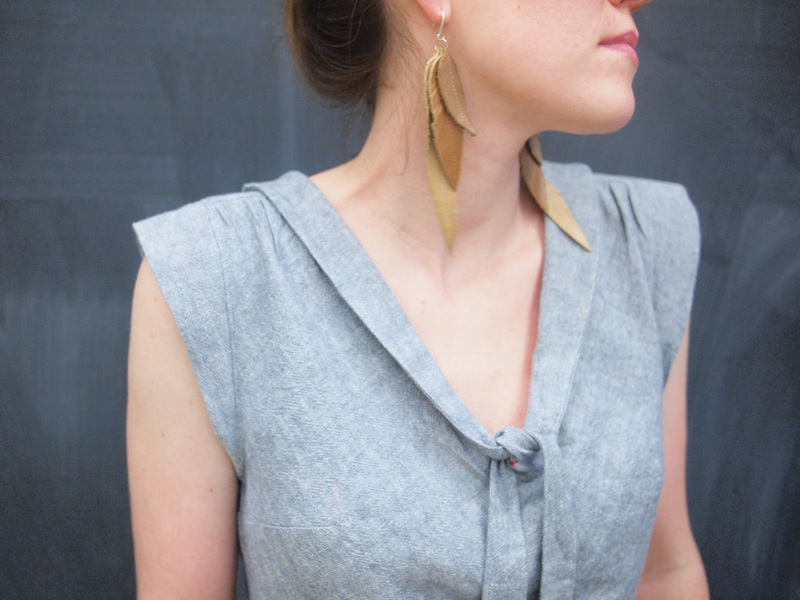 Kate learned to sew from her paternal grandmere, Yvette, and to knit from her maternal grandmother, Verna. Courtney learned both from her maternal grandmother Julia Ann. 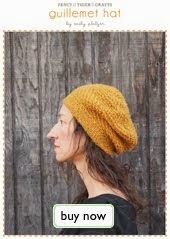 She learned to crochet from her paternal grandmother, Lucy. We were both kids when we learned. Kate’s favorite animal is a shark-honey badger-dog, so I guess that’s a chimera? No…it’s really a dog. Courtney’s favorite animal as a pet is a dog, in particular Queenie, Queen of Dogs, her corgi/sheltie mix. But she also likes pikas. They leap through the air with wildflowers in their mouths! Seriously. Thanks Kate & Courtney! 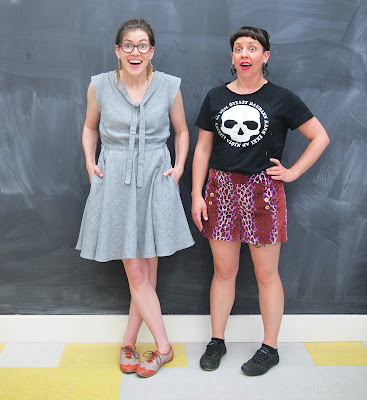 Happy sewing and knitting and everything else you do that is awesome!! Do you guys sell the reglisse dress pattern? It looks so cute!